I just walked away from another conversation about money, kids and savings. So let me take this opportunity to talk about a book I am reading and recommending. It seems like recently I am going about my day and all of a sudden I find myself talking or thinking about this book. I have been reading through it in pieces but I am now recommitting to giving a page to page read and review. In case you can get a copy before I finish…it is facilitating amazing conversations about money in my every day life. Get it. Read it. Let’s talk. 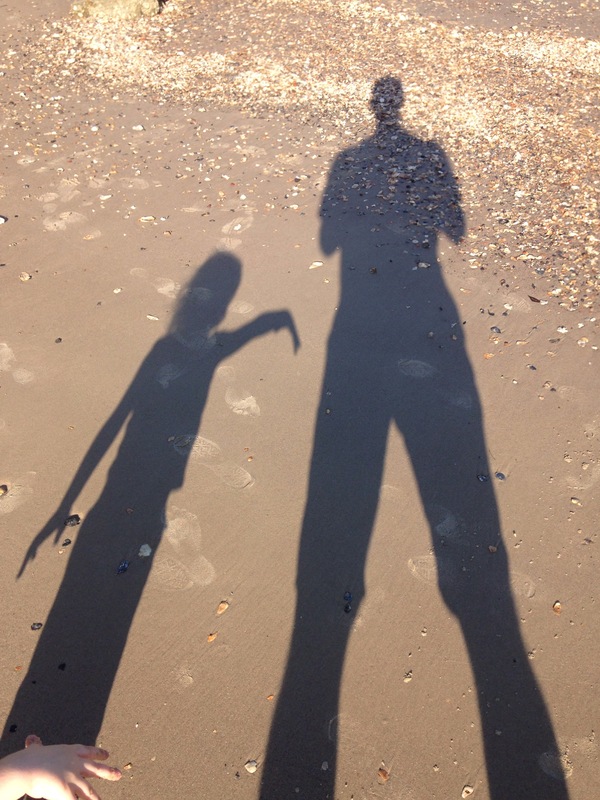 My daughter finds comfort in her Shadow. She runs with it, jumps, with it, chases and follows it into happiness or the unknown. She speaks about her Shadow as if it is real and slightly separate from her. She is 4 years old. J wasn’t always enamored with her Shadow. When she first began to walk and explore her world, she noticed her Shadow and it confused her. When she saw shadows in books, movies or her room, she was skeptical, cautious, and inquisitive. However, she was not connected to them, they were completely different entities. Now, her Shadow is part of her and her friend. “My Shadow”. Its like Peter Pan I guess, or like a not-so-invisible friend. It is fun and sweet. Sometimes I will overhear her talking with Shadow. This uninhibited love and ability to connect to her universe is a beautiful skill I wish as adults we held onto longer. What age or situation is it when doing something like having fun with your Shadow is considered crazy? I hope for her sake it is no time soon. I am having my lunch and reflecting on Tuesday’s exciting and emotional event. Kindergarten Screening…I was calling it Orientation but I found out yesterday that I get to go to another visit/orientation in August. This was a chance for some of the teachers and psychologists at the school to meet & greet the families. They also separate the kids from the parents to check on some skills before placing them in classes. This did not go as well as I hoped. I am staying positive and open to learning more about my child and our journey together. She is magical. When she was born 4.5 years ago, I knew I was on a journey of empowerment, discovery and humble love. J has always pushed y understanding of self and a women’s role in this world. Because I want to provide a healthy happy life for her, it is causing me to examine the way we treat women, girls and children. This is all material for some other blog posts, but what I can say now is that her time at Kindergarten Screening was emotional, enlightening and a little difficult. When we arrived we were instructed to wait in the vestibule with other families. We did not have to wait long and the staff at her new school are very kind. However, immediately after being escorted into a busy hallway, we were told we were being split apart from our kiddos. They would go one way, parents another. Juliana was trepidatious about this and didn’t want to go. Understandable so as it was her first time in the building with a lot of people she doesn’t know. I had to accompany her at the start. She was shy and nervous. They jumped right in to reading a story. A story she knows by heart but she clamped down and would not respond. She is reluctant to share herself with strangers…again I do NOT see this as a detriment. However, since my little girl came into this universe, other people have made us feel that this is not normal or not ok. (Again, I will write about this again another time) We worked through a couple of sad, teary and tough moments. I was able to pull myself away and go find the other parents. Her school is lovely. I was sure to watch the interactions between the teachers and Principal. I wanted to see if I could sense any clues as to how things really are when families are not watching. We had a great visit from the PTA rep and we were encouraged to make little cards that will be given to our children on their first day of school. It was fun. I had this little voice or tug inside that kept me connected to her. I was sending out my energy throughout that building letting her know she is loved. They conducted some “testing” with her. I did not get to see what they did or how she responded. Chances are, if the teacher did not take time to let her get warmed up or comfortable, she may have done nothing. It is a little sad to think J will look as if she can’t do certain skills that are actually easy for her. When I was still in that room with her she was refusing to write her name. Meanwhile, she can spell and write her first, middle, and last name. Oh well, we have to let go, right? My husband and I are realising that she will come across to others a certain way in the beginning. But on her terms, in her time, she will let the world bask in her light. She will shine. It’s a big day in our house. I am taking a half day at work on Tuesday for Kindergarten orientation. I am probably more nervous than my daughter. I am actually surprised at her excitement. I would have thought she would be terrified. She is a cautious and shy child. She can transition well from place to place, activity to activity. However, transitioning from person to person is where she struggles. She is not immediately trusting of people, which can work to our advantage in life. J is very bright and loves to learn. I am hoping that this next phase of our lives is met with enthusiasm and joy. She has such a thirst for knowledge. I know that the drone of routine can be beneficial but also stifling. I want my daughter to love school. Not just because it will make life easier for me, but because I think one of the greatest qualities a person could posses is a love of learning. I know that learning doesn’t only happen at school – but if she hates school, it may turn her off to learning in general. Before we were released for Spring Break, I felt it was important to check in with my students and our passage from Midsummer. Now, it is not in our curriculum, unit plans, and it is not necessarily linked to anything we have been working on. It is simply something I love that I am sharing with my students. I had given them a couple of lines we hadn’t done yet. They were perplexed. I told them to figure it out. Look at what they were given and break down the ideas, the code. I told them to look for things they know. I was shocked that they started discussing meaning of words, rhyme scheme, and flow. It was incredible. They did it! They put it together without me ‘telling ‘ them. Then the most amazing thing happened, one of the students went to another group of four kids and challenged them to put it together. I was exhilarated and proud. 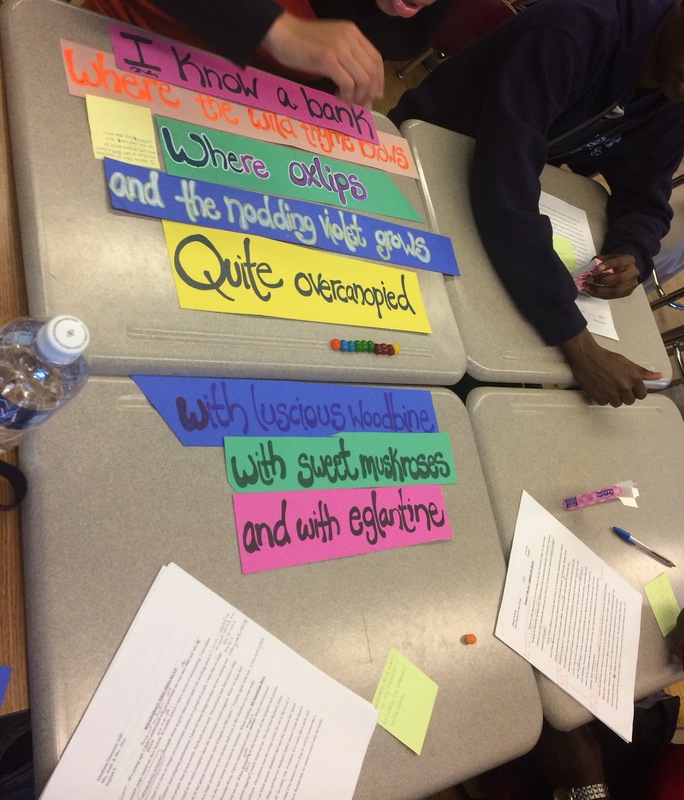 They were not only engaged in shakespeare’s words, but they were utilizing higher order cognition and having fun. This five to ten minutes was some of the best educational experience they would get for the day. Thank you Shakespeare.